ChildChild age: 5-12 years old. Under 5 free. Please be sure to CALL to check availability. All information is listed on your ticket. Savannah Riverboat Cruises offers a marvelous cruise that provides a unique overview of Savannah, a port city with a colorful legacy and legendary seafaring tradition. This two hour dinner cruise is a wonderful way to unwind, sit back and relax while you slowly cruise down the Savannah River. The Georgia Queen, a stern-wheel paddleboats and the Savannah River Queen are majestic riverboats that host a variety of scenic tours. Operating under strict U.S. Coast Guard regulations and passenger safety rules, these climate-controlled triple-decker boats are comfortable year round. Climb aboard one of these red, white and blue vessels for dinner, live entertainment and a memorable tour of Savannah. 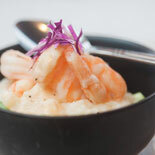 The delicious buffet dinner features a beef carving station, fresh catch of the day, lemon & artichoke chicken with spinach, Savannah shrimp & grits, and much, much more! 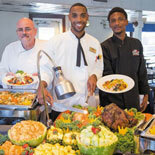 After dinner, one of the riverboat entertainers will play the hits from the 50s to today. You can experience the refreshing river breeze while out on the spacious open-air deck as you enjoy the sights and sounds of this historic city. Savannah Riverboat Cruises is an iconic emblem of Savannah's waterfront. 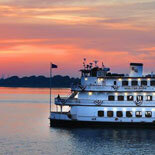 Get your eTicket today as no trip to Savannah would be complete without a cruise on the river. Boards 6:00 pm. Sails from 7:00 pm- 9:00pm. April-October: Sails Daily; November-Feb-Sails Fri only and some select Mondays (check calendar) March: sails Fri and Sun. E-Ticket vouchers NOT Valid on July 4th, Thanksgiving Day, Christmas Day, New Year's Eve and New Year's Day. Child Ticket: 5- 12 years old. Under 5 are free. Reservations required at least 24 hours in advance of tour. 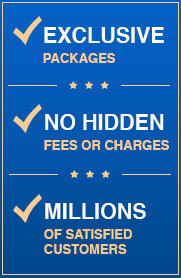 For groups of 10 or more an additional service charge is applied. 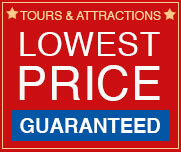 You MUST call to get group rates: 305-433-8395.